but the real party has just started! in this, we are all united and focused. I was tempted to write ‘LOCK THE KNEE’ here and leave it at that, but this posture is so much more! Nevertheless, in most of your classes, the teacher will start this posture with a ‘Lock The Knee’ lecture. The reason for this and the repetition time and time again, is not because we are a group bonded by our obssesion with knees. There is a potential for injury, when kicking out on a bent knee: you put undue pressure on the lower back and you leave the knee open to injury, if it twists. So, guys and galls, let’s learn the hows, wheres and whys to that locked knee. Stage 1: – Locking the Knee! Stand straight, feet together, stomach muscles contracted. Eyes focused on one point in-front of you. Shift all your weight into your left leg, equally distributed into the left foot. Contract the quadriceps muscles on the front side of the leg, this lifts the patella, creating space in the knee-joint, in turn strengthening the soft tissues around the knee-joint to help protect the joint. This is ‘locking the knee’. If you look at this action in the mirror your knee actually will lift up. As well as the quad you need to engage the glute muscle on this balancing leg. NEVER jam your knee back, this is about muscle strength. Don’t worry, if at first you don’t succeed, keep trying, keep engaging, you will build the strength in your muscles and eventually one whole minute of quad contraction will be yours! You should never feel a pain in the back of the knee. If you do, you could be hyper-extending your knee. A hyper-extended knee has an almost bow like look in the mirror from the side. If this is you, try moving the weight forwards into the front of your foot and big toe. If you think you might be hyper-extending your knees, always speak to your teacher, they will be able to advise you. Interlock your fingers and thumb tightly together and lift up your right foot. With those stomach mucles still engaged, hinge forward at the waist and pick up ball of the right foot, never loosening your grip. 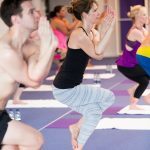 If you are unable to pick up the foot, then start simply by bring the leg up and extending the arms out, hovering the palms along the sides of the knee. NEVER GRAB THE KNEE. Every class see, if you can move the arms/palms lower down, closer to the foot. Eventually, as your flexibility improves, the foot will be yours. Always challenge yourself and you will make it. Stage 2: – Kicking out. Knee locked, inhale, slowly, gently lift your right leg and stretch the heel forward towards the mirror. Keep your hips in one line. It is common here for our hips to fall backwards throwing our weight into the back of the legs or the lower back: if this is happening, focus on kicking the heel out further and, if necessary, move your weight forward in the foot, to bring yourself back in to alignment.Keep kicking till the right leg is straight, no bend in the knee and it is parallel to the floor, hips in one line, heel facing the mirror and toes turned in facing you, all the time keeping the left knee locked out. Once this is achieved, you have successfully completed stage 2. Stage 3: – Elbows down. Your left leg is locked out, quad engaged, leg is unmoving, your right leg is out straight (quad also engaged), the heel continuously kicking towards the mirror and your toes are turning in towards your face. Hips are in one line and you are solid. Now bend your elbows and move them down till they are hugging the calf muscle, with the tips of your elbows below the calf. Stage 4: – Head to knee. Now you are ready for the final stage of the posture. First, shift your gaze downwards. Tuck your chin to your chest and come down till your forehead is touching your knee. All the time keeping your stomach muscles engaged, both legs engaged and quadriceps contracted, heel continuously kicking towards the mirror and toes turning in towards your face, with the fingers and thumb tightly interlaced around the ball of your foot. You are AWESOME! Look at what you have achieved. Slow and steady really does it with the Head to Knee race. Now come out the way you came in, stage by graceful stage: curl up and untuck the chin, bring the elbows back up, bend the right leg at the knee, release your grip and return the foot to the floor. Now that you have climbed Mount Everest, let’s do the other side! Uses all major muscle groups. Exercises digestive and reproductive organs.